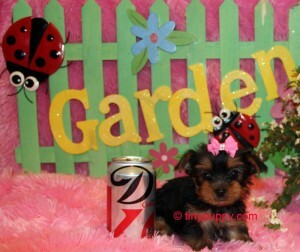 Teacup Yorkie Ariel – 22 oz at 7 weeks. 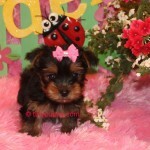 Teacup Yorkie Ariel comes from top notch bloodlines and is absolutely beautiful. She has a very soft plush coat that will be beautiful as an adult. She is sooo tiny at 22 oz and 7 weeks old. 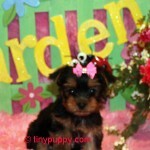 She is 1/4 parti Yorkie. 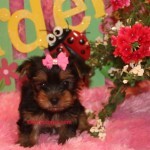 Her Grandfather is a Parti Yorkie and comes from the Nikkos Championship Bloodlines. She is tiny, cute and very lovable and enjoys playing with her brother Aiden and Sister Abigail. 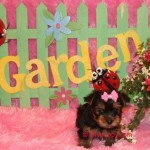 She is working on her Pottie Pad training and would be the perfect little baby for you or your family.